Freedom Forum conducted a day-long national workshop on “Promoting right to information and open government data in federal Nepal” in the capital city Kathmandu on March 23. It was organized with the support of The Asia Foundation. Bringing together 90 plus participants from the right to information and open data community, including the government agencies- Office of the Prime Minister, Central Bureau of Statistics, National Information Commission, civil society, research and academia the workshop witnessed presentations on different aspects of RTI and open data practices and challenges, sharing of experiences and underscored the collaboration among the multi-stakeholders to expand the regime of RTI and open government data for the transparency. In the opening of the workshop, Tirza Theunissen from The Asia Foundation said in the context of federal Nepal, access to reliable and accurate information and open data- the data that can be used and re-used – is critical for citizen to take part in local level decision making and hold their locally elected leader to account. “Information and open data are essential for citizens, media and civil society organizations to track local development progress and support provincial and local governments in making evidence based decisions, planning and resource allocations,” she stressed. Executive Chief of Freedom Forum, Mr Taranath Dahal, said the program was organized to ensure the rights of the people to be informed, easing their access to data, statistics and documents from all three tiers of the government in the context of changed state structure. “We believe that adoption of transparency, openness and accountability with high priority by those governments in their structures, policies and practices would help any governments in the future op be open, transparent and accountable,” he added. To help, to reinforce, and to contribute for better performance of the governments is also the responsibility of the civil society. It is also the aim of workshop, according to him. On the occasion, Director General of Central Bureau of Statistics, Suman Raj Aryal, said the CBS was receiving many of questions and assistance from the provincial and local governments that they needed statistics on various sectors in their respective provinces and local levels, but we had not. According to him, the CBS was conducting the economic census for the first time in Nepal as per the federal set up and need of diversified data in the local and provincial levels. He argued that data collection method was changed from triangular to multi-angular. Information Officer at the Office of the Prime Minister, Mr Chirinjibi Paudel, said a common understanding among all sides on the open data would help further debate and practices for the transparent culture. Similarly, Programme Director at the Asia Foundation, Bishnu Adhikari, said actual transition has begun now with three governments starting their work. However, actual physical transfer of data and resources from the central level is yet to be realized, he added. Chief Information Commissioner, Mr Krishna Hari Baskota, said the OGD is the watchdog for the activities of the government. It promotes good governance. He reminded that the countries as Netherland, Denmark, UK and others have been benefited by the OGD. “Demand and supply of the data itself cannot be accessible unless supported by the legal provision. We need to adopt policy on OGD to make headway to developed nation. It is necessary for empowering the citizens in democracy,” he underlined. “The wave of technology is already in the air in Nepal too. Now, the storm is coming,” Chief Executive Officer of Bikas Udhyami, Santosh Gartaula, announced, adding that his organization was ready to provide help to anyone to access database in any format he/she wants to use. During the presentation, he pointed out the need of recognition from the government to their works that they have made government data available free of cost by running a website www.nepalindata.com . General Secretary of FF, Mr Dharmendra Jha, said open data could help expand RTI. The self disclosure is the soul of RTI, according to him. Mr Bishusan Bista from Young Innovation said his organization was going to update the websites for the visually impaired people. “We have supported the techno hub but the manpower shortage has hit the local people,” he added, and informed that mapping of the existing data ecosystem was ongoing. During the workshop, four groups were formed and discussion held on numerous issues as that are barriers to promotion of RTI and open data at local, provincial and federal levels. They also mulled the activities needed to address the problems and exercised for identifying the actors. Group A was named: Promoting the right to information and public disclosure, while Group B: Identifying local level data needs and filling gaps, Group C: Enhancing data literacy, and Group D: Building capacity to use data at local level. The RTI activists demanded the NIC be a strict inspector of its decisions on RTI implementation. 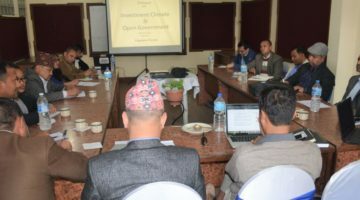 The participants advocated for open government data and right to information practices in the changed context that the local governments in Nepal are burdened with numerous roles to public service delivery. They argued that the flow of data and information in Nepal was still traditional- from top to bottom approach- while the need of data at present was in bottom up approach. The villagers do not need GDP data/information but the budget and time for rural road construction, they added. 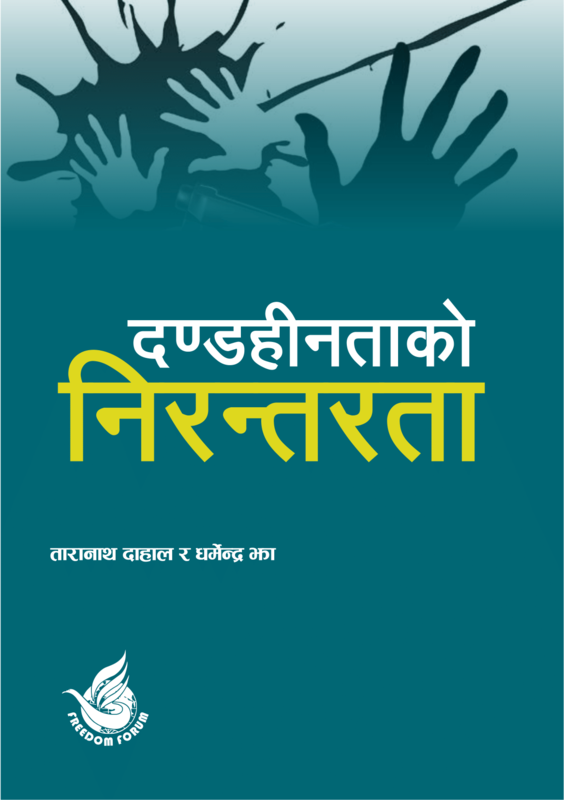 At a time when the transparency and accountability to ensure good governance is an urgent need in federal Nepal, the effective implementation of RTI and practice of open government data was underscored by many. In the concluding session, Freedom Forum Executive Chief Taranath Dahal observed that the synergic efforts from the RTI activists and open data community involving the concerned bodies including government agencies would be helpful to ensure transparency in the federal system, so that the concept of vibrant democracy would be implemented. Information Commissioner Yeshoda Timsina said the National Information Commission was ready to cooperate and collaborate on any innovative idea that helps propel the RTI and open data regime.